Wee Glebe in Kirkland, near Thornhill sleeps 2 people. Wee Glebe is situated in the peaceful hamlet of Kirkland, close to the charming village of Moniaive, which is renowned for its artists and local festivals, this beautifully converted, 200-year-old stable is located close to the Galloway Forest Park, the UK’s first Dark Sky Park. Wee Glebe has a south-facing, walled garden and elevated views over the Glencairn Valley. This is a popular area for walkers, shooters and cyclists, with world-class mountain biking at Mabie and Dalbeattie 7Stanes, both nearby. Located close to the spectacular Solway coast with golden sand flats with shingle, rock pools, fossil beds, cliffs and caves. With unspoilt villages, dramatic coastlines, sandy beaches, rocky coves, magnificent gardens, castles and ancient monuments, this is the perfect holiday location to explore this beautiful, scenic area. Wildlife is in abundance, with the RSPB nature reserve within easy reach, and red squirrels can also be seen in the area. Golf courses in close proximity and for fishing enthusiasts the River Nith is one of Scotland’s premier salmon and trout rivers. Historic attractions include Morton and Sanquhar Castle, Robert Burns’ House and Drumlanrig Castle. It is also rumoured that Annie Laurie is buried in the local churchyard nearby. The shop, pubs and restaurants are all 2 miles from Wee Glebe. All on ground floor: Living room with French doors/kitchen with beams. 1 double bedroom with en-suite shower room and toilet. Wood burner in living room (initial fuel included). Electric central heating, bed linen and towels included. Travel cot on request. 32 Freeview TV. DVD. CD. iPod dock. Electric cooker. Microwave. Washer/dryer. Dishwasher. Fridge/freezer. Wi-Fi. Enclosed lawned garden with sitting-out area and furniture. Barbecue. Chiminea. Parking (2 cars). Wee Glebe in Kirkland has a hot tub. Pets free of charge. No smoking. For a better idea of where Wee Glebe is, you can see Wee Glebe on the map below. Wee Glebe is in Dumfriesshire; should you be on the lookout for a special offer, you can find all the special offers in Dumfriesshire. It's always worth checking to see what is on offer at the moment. 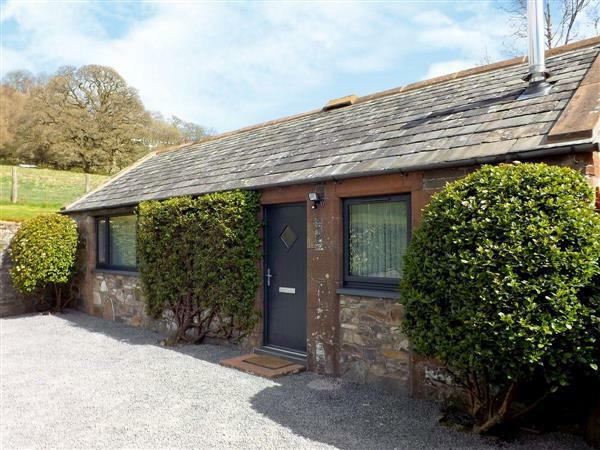 Do you want to holiday near Wee Glebe (30500), you can see other cottages within 25 miles of Wee Glebe; have a look to find your perfect holiday location.